Today a rest day in Addis Abada. These rest days are nice changes after riding hard for five days. On my own cycle touring I would ride less hard but also have fewer rest days in between. I’ve sorted through and handed off my laundry. Still on agenda is cleaning up my drive train and checking through the bike. The web site gets updated (at least here where we have internet). 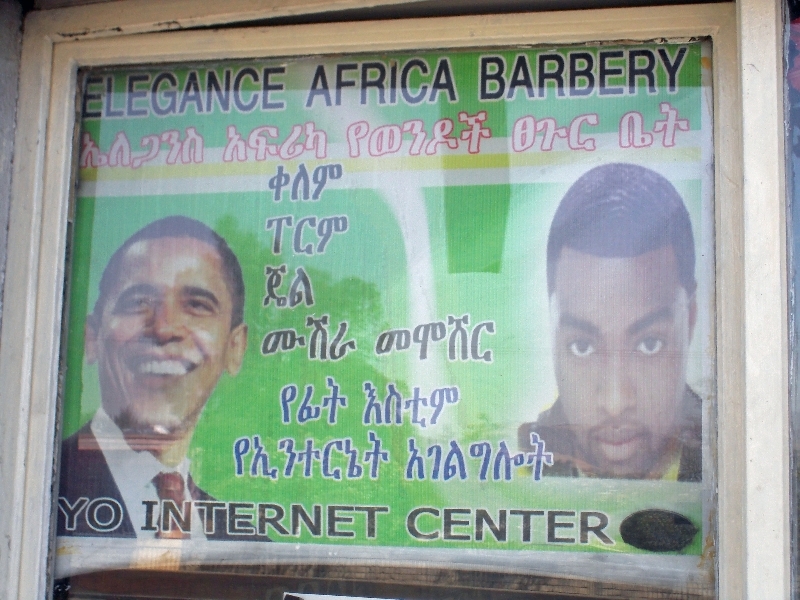 This is also chance to reflect back on ride so far and what I’ve seen in Ethiopia. I didn’t get a haircut today, though found the following sign amusing. 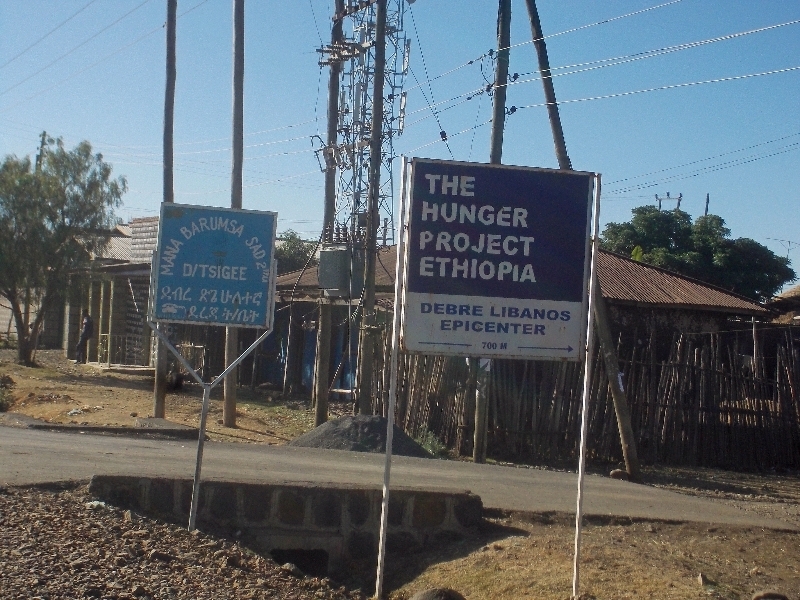 Two quick reflections today: one on TDA Khartoum to Addis Abada section and one on what I perceive on how Ethiopia donations go. First two days from Khartoum were longer riding, but otherwise not too difficult. The next three days were off road. Not just any off road, but also through areas with very rough corrugations. This combined with hot temperatures stressed many riders, myself included. Some with heat exhaustion at end of third tough day. After the rough roads, one hot somewhat flat section to the Ethiopian border and then the climbing began. Climbing in this part of Ethiopia had many short and steep (~10%) grades and day into Gondar was 2500m of climb. 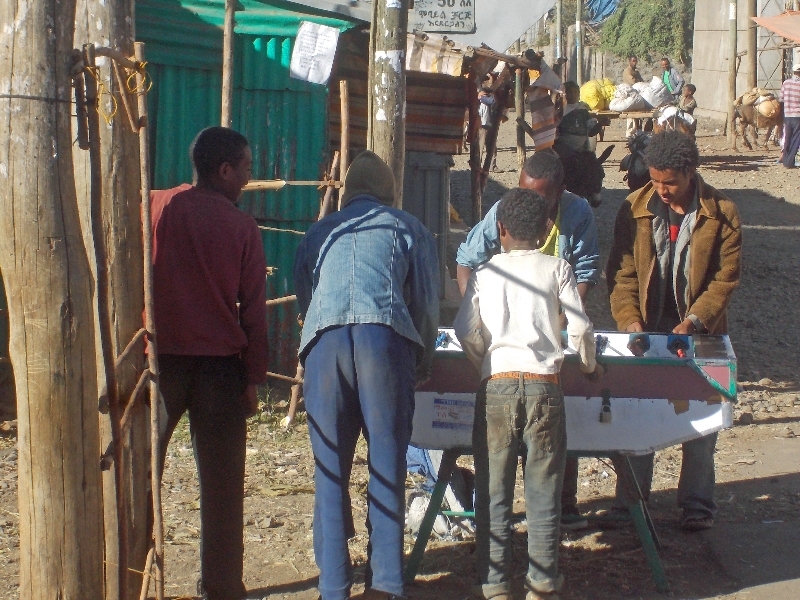 By the time we got into Gondar, some cyclists also started getting sick. It was off and on and you would see different riders sick on different days. My guess is combination of having pushed so hard, along with new foods and bacteria. Two days from Gondar to Bahir Dar were a bit of a recovery, not as difficult as before. Five days from Bahir Dar again had substantial climbing on all days and some long days. On thing many riders try for is “EFI” or riding Every F*** Inch. That wasn’t as tough to do in Egypt, but as limits got reached in the off-road, hot, climbing days and combined with some sickness – it has changed some. Still a number of folks out there riding every day but also more picking and choosing to ride what makes sense and backing off occasionally. The next section from here to Nairobi is also rated as a “5 of 5” for difficulty. You can read the description here but looks like both challenge and very interesting section ahead. I continue to be impressed with structure and organization of TDA. It takes a certain approach to bring folks through this area and people and equipment become stressed in the roughest spots. However, attitudes and approaches make this work. I’m also still having fun :). Most of the Ethiopian people live on the land. For a country of 90 million, it surprises me that only 3.5 million are in the capital city. Our bike travels take us through that countryside during the “dry” season. We still see harvested gains being brought to market, large stacks of hay and also much goats, sheep and some cows being grazed. Most people seem to live with subsistence agriculture. We see evidence of outside aid/help along the way. For example, sign below of “Hunger Project” and others like it. We also see trucks from World Health Organization (WHO) in white with big “UN” lettering on the front. I see things like “Water Project for Village X donated by Y” and generally feels like a good thing, particularly in contrast to ever present yellow jerry cans being filled with water and carted around. Outsiders are helping with basic needs. Sometimes we see different things in the villages. For example, a sequence of foosball tables, table tennis and even a shuffle board. These seem to also be in demand and use. Not sure if it was foreign project, but also see some that have me scratch me heads. 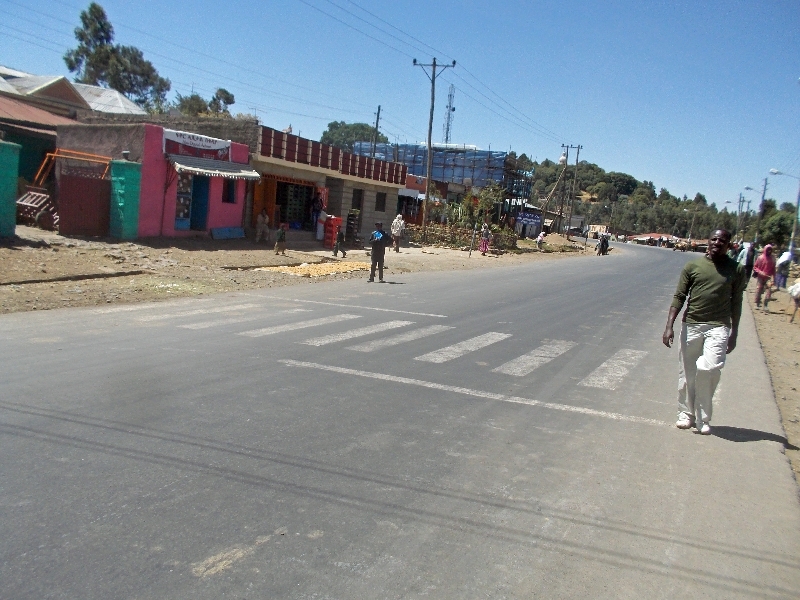 Many of the villages have these painted crosswalks, some with stop lines in front. They don’t seem to be used and seem slightly strange in a place where everyone and everything will walk along and across the road wherever they wish. If so many are asking, it much work in some cases. I wonder how often aid workers or others help sponsor this thought by giving away? In any case, it is interesting to reflect on this and also see how other riders react. I’m probably more patient than many though still a bit much along the way.